Earlier this year I had written a post Say ‘NO’ when you have to; And do it with Confidence. I wrote it when I was reminded of an earlier career incident when a friend had told me that I had a problem with Saying NO. For the past few years since I have been exploring the ways of Minimalism and Essentialism. One reason is because a lot of my professional work revolves around prioritization and coaching the art of prioritization, opening up calendars, the need for Thinking Times in order to be efficient and so on. 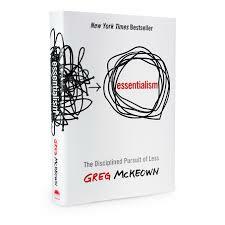 So it was a treat to read Greg McKeown’s book Essentialism: The Disciplined Pursuit of Less. Since it is an area that fascinates me the book was one sitting read. I don’t usually have such one sitting reads. But in a flight from US to Bangalore you get some quality reading time. Greg’s insights open a lot of possibilities for you to enhance the way you work. If you have found that your available time is filled with so much work and even after spending time trying to clear up your ‘To Dos’ you find it just reappearing in different names, shapes and forms. If you feel that the world is conspiring against you to ensure your calendars do not have any open space to really work. If you are consumed by meetings and you end up taking a day off to catch up for the actual work you get paid for… it is time to change. Everything might not because you say ‘Yes’ when you have to say ‘No’. There is a lot to do with how you look at work and figure what is the most vital work among the trivial thing that get thrown at you. As Greg asks ‘How do we discern the Trivial Many from the Vital Few”. It is achieved through a disciplined pursuit. We all struggle to prioritize and we now live in an era where we have to address conflicting priorities on a daily basis. I would say some of these thinking should be taught to students and the youth entering the work force. I would say companies need to have an Essentialist on their payroll. Highly recommend to you all…. to read this book! !